Previously: Valjean and Cosette fled Javert and landed in a convent garden. Then we learned all about the convent’s history. Fauchelevent turns out to be a former legal clerk. Then he took a cart to the knee. He figures he can come up with a cover story for Jean Valjean and Cosette to stay, but the hard part is sneaking them out again so they can be seen coming through the front door. Cosette can fit in a basket, but Valjean? Having established himself as indispensable but harmless over the last two years, playing dumb while observing everything, Fauchelevent rambles to the prioress about how he’s getting old, the garden’s so big, and could he maybe trouble them to let his brother come to assist him? Oh, and he has a granddaughter who might attend the school, and who knows, one day she might choose to join their order? The nun, upset at the city’s usurpation of a spiritual matter, goes on a rant about secular vs religious authority, and even Hugo remarks that she’s going on a tear. Fauchelevent comes to Valjean with two problems: getting Valjean out, and getting the empty coffin out. If only he had another body to put in it…. Shrewd as he is, the idea of smuggling Valjean out in the coffin doesn’t occur to him. It literally is inconceivable. To Jean Valjean, on the other hand, an ex-convict with three escapes behind him, it’s easy to contemplate. He’s seen worse. Even long-winded Victor Hugo knows if you describe a plan in detail, you don’t need to portray the execution of it until the point where it goes off the rails. In this case, the grave digger Fauchelevent had planned to get drunk so he could sneak Valjean out of the coffin turns out to be dead. The new guy? Teetotaler. Hugo is actually having fun with the quirks of this new gravedigger, who is a failed writer but still works as a scribe for illiterate clients. Love letters by day, graves by night. As Valjean gets buried alive, the scene above the grave is actually comic. By the time Fauchelevent chases the new guy off and gets down to open the coffin, Valjean has fainted. Fauvent is convinced Valjean has suffocated, and laments at length about this cruel trick of fate. Then Valjean opens his eyes. Commence freaking out. As the new assistant gardener, Valjean compares the nuns’ life in the convent with the prison life he knew — oddly similar, but on one hand voluntary austerity and deprivation leading to greater virtue and on the other hand enforced, leading to hatred, and finds himself moved to humility. That wraps up Part Two: Cosette. Next up is the jump forward in time to 1832 and the urchins of Paris. Pages covered: 451-491. 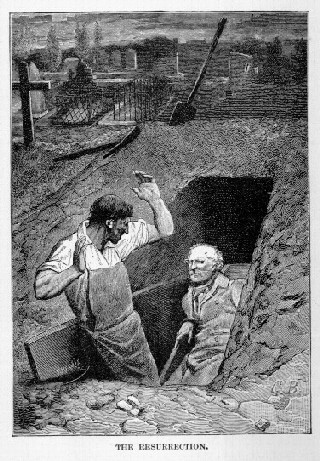 Image of the grave situation by de Neuville from an unidentified edition of Les Misérables, via the Pont-au-Change illustration gallery. This entry was posted in Book Commentary and tagged Convent, Fauchelevent, Graveyard, Jean Valjean, Paris, Religion on April 13, 2013 by Kelson Vibber.